We are excited to introduce you to our powerful new feature called Segments! 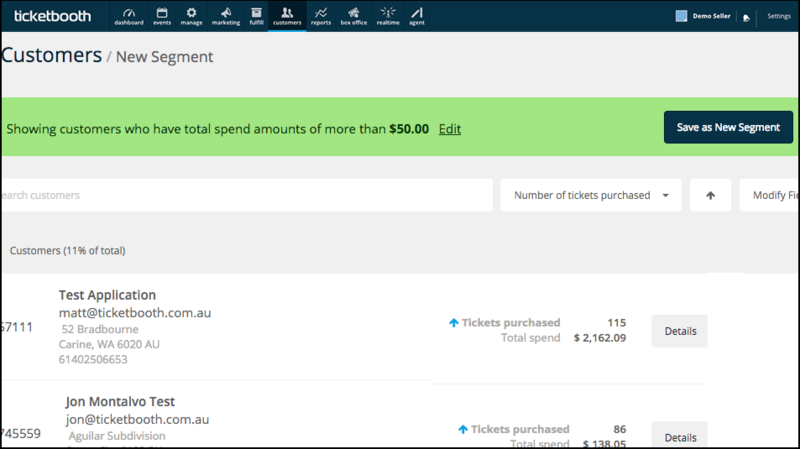 Segments is a completely re-imagined functionality for the Customer tab that allows you to easily identify, group, and organise customers based on demographic criteria, spending habits, purchase history, event attendance and more. We have redesigned the customer search engine in order to provide a clearer navigation. This update also permits deeper search queries. You can create a new segment by using the options provided. It is also possible to filter your selection down to a segment you already created. Up until now you could only search your list of customers by customer name. With this new feature, you can search your list by entering a name, phone number, number of tickets purchased… and many more options, into the search field. Adjust the default layout for your list of customers results by using the “Modify Fields” button and choosing what fields you would like to show. It is possible to export and download the current list displayed by clicking “Export CSV”. Customer Segments are groups of customers organised by common parameters you can establish. The creation of these segments has been included with an overall redesign of the Customers section in the Admin. The new section allows better filtering and sorting options. It also provides the ability to export a CSV of a particular segment. The Customer Segments feature introduces some minor adjustments to the Email Campaigns feature. The adjustments alter how users send operational emails. 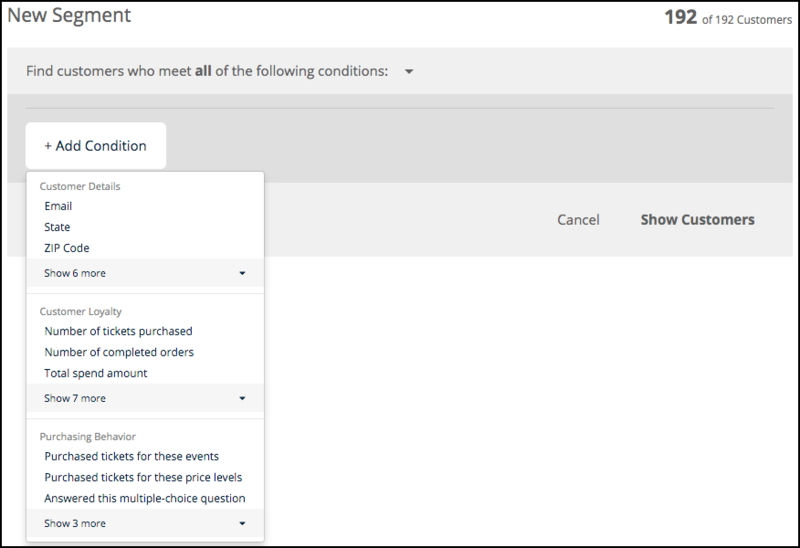 Besides, it also adds the ability to select a segment as a group of recipients — in addition to the pre-existing ability to select event attendee lists. We have added a new step to the process of sending an email campaign, along with redefining the types of emails you can send. Marketing Email. These email campaigns are for promotional purposes. So for instance for promoting your next event or announcing a coupon code to past customers. Campaigns may be sent to segments or attendees of selected events. Operational Email. These email campaigns are for special, urgent communications to your customers, such as cancellations or time/venue updates. Campaigns may only be sent to event attendees. Send to Event Attendees. Customers of selected events (and optionally, price levels). Send to Customer Segments. Customers within segments you have previously saved. For event attendees – The process for sending to attendees has remained the same as the previous version of Ticketbooth’s email campaigns. For customer segments – You may only send to segments you have already created.